Her arched back, immense girth and short blunt nose makes Scarboard the epitome of a charactered Great White shark. When this animal turns up, her sheer size and presence simply demands your attention! Easily one of the biggest sharks at Guadalupe, she may also be one of the oldest. 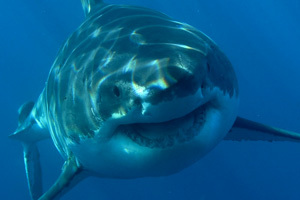 No-one knows for sure just how old Great White sharks can get but the latest estimates range from between 40-80 years. If her battle scars are anything to go by, Scarboard has lived a long and hardened lifetime. 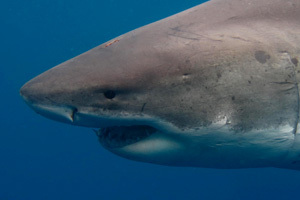 She has been seen for almost 10 years at Guadalupe but her notoriety really grew in the 2016 season when she dominated proceedings of many cage diving trips. When Scarboard swims by and opens her mouth, you know about it! 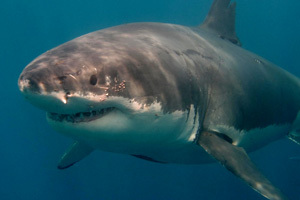 With her unique shape and features she also looks like no other shark at Guadalupe. This mega female has fast become many of our teams’ favourite sharks and for very good reason. If she is over 50 years of age we still hope to encounter this beast for many years to come. Share the Scarboard the shark love on Facebook! Want to meet Scarboard? Book with Shark Diving Xperts today!